Title: 10/26/1987 - Labeling and MSDSs for a stump router cutter head which has carbide tips on the cutter teeth. This is an update to our response of October 1 to your inquiry concerning your labeling and material safety data sheet responsibilities under the expanded Hazard Communication Standard. As you explained, your company manufactures stump removal equipment. Each stump router cutter head has carbide tips on the cutter teeth. Your customers sharpen the cutter teeth by grinding the carbide tips. Since the cutter teeth are solid metal, the required label may be transmitted to your customers at the time of initial shipment and need not be included with subsequent shipment to the same employer unless the information on the label changes. The label may be transmitted with the initial shipment itself, or with appropriate material safety data sheets that are to be provided prior to or at the time of the first shipment. You may also affix the warning label on every cutter head guard of the machine. 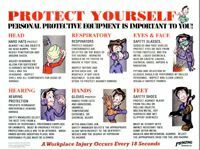 Such action may assist your customers in complying with the Hazard Communication Standard. 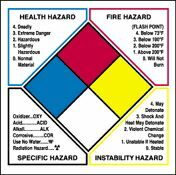 As discussed with Joyce Doty of your company, material safety data sheets are required for each hazardous chemical which could potentially present a physical or health hazard during the normal use of the product. Thus, a material safety data sheet would be necessary for the carbide tips. For the general metal components, however, a material safety data sheet would only be necessary if routine use or maintenance would likely involve exposure to metallic dust or fumes. Listing the general metal components of steel products is acceptable if a material safety data sheet is necessary. It is not a requirement to send material safety data sheets to nonmanufacturing customers who were shipped hazardous chemicals prior to September 23, 1987.